Hartmut Esslinger knows a thing or two about industrial design and what it’s done for Apple. He worked directly with Steve Jobs to establish a “design language” that was used on the Macintosh line of computers for over a decade. Esslinger’s iconoclastic firm had already designed over 100 products for Sony when he signed an exclusive, $1-million-a-year contract with Apple in 1982. But that Apple is mostly gone, says Esslinger in an interview with Quartz. The Apple of today resembles Sony of the 1980′s, says Esslinger, who witnessed the succession process at Sony first-hand: The visionary founder has been replaced by leaders who aren’t thinking beyond refinement and increasing profit. One reason Esslinger is willing to recount his time with Jobs is that on October 9, at the Frankfurt book fair, he will release a design and management memoir recounting his time with Jobs, called Keep it Simple. By Esslinger’s own account, when he started working with Jobs in 1982, Apple was a fractious company in which designers reported to engineers and many in Apple’s corporate structure were openly hostile to the founder’s influence. (By 1985, Jobs had been forced out; he returned in 1996.) At the start of his work with Esslinger, Jobs knew that design could help define Apple’s brand in a way that no amount of marketing could accomplish, and from the introduction of the Macintosh SE, Esslinger’s “Snow White” design language defined the appearance of the Macintosh, visually integrating its outer plastic shell with the software it contained. 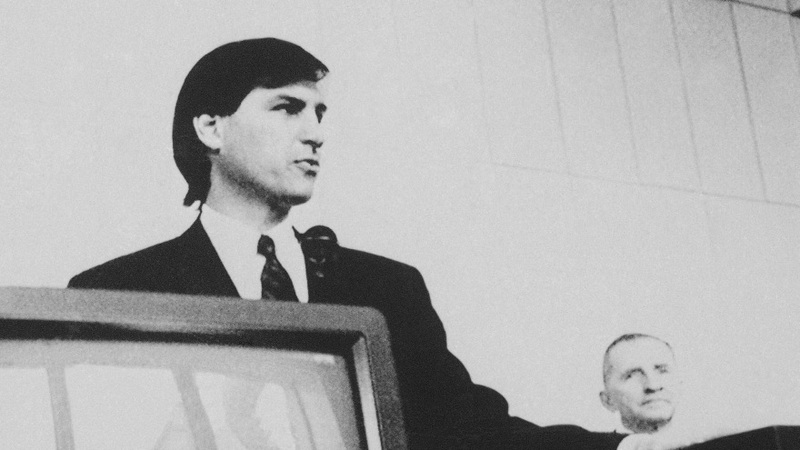 As early as 1982, Jobs had already conceived of a “book-like computer,” though the project was not discussed outside the company. That vision eventually led to the Apple Newton, a tablet that failed, and the iPhone and iPad, which made history. That kind of vision is now lacking at Apple, Esslinger says. So if a disruptive new company—the Apple of today—were to emerge, what kinds of products might it make? Esslinger, who retired from Frog design, the company he founded, in 2006, now teaches all over the world and especially in China, and he says that his students are primarily focused on three-dimensional interfaces as the “next big thing.” Their inspiration? Video games. Just as important to the future of human-computer interaction, says Esslinger, will be a re-thinking of the integration of hardware and software. One example he gave was concept designs Frog did in collaboration with MIT, for flexible computers that responded to squeezing and other types of unconventional touch input. Subtle touches like that are now an Apple trademark, but refinement can only take a company so far, and the conservatism inherent in how design groups within companies must answer to their bosses means that companies tend not to innovate, says Esslinger.